We have had a wonderful beginning to the 2014 year. My wife, Eve, and I had the joy of our lifetime by being able to spend the month of January split between New Zealand and Australia. We met some wonderful people of both countries and made 30 new friends as part of our tour group. We were impressed with how well people were pleased with the healthcare delivery system in both countries that assured essentially universal access. I realize there is only minority support for a public option in our country, but I was impressed that they do a far better job of assuring universal access and controlling costs. I have been very pleased with several events. Our fellowship dinners where we have been able to encourage current members to pursue fellowship status; our SEP/MOC sessions held in Philadelphia and Hershey, led by Drs. Ballard and Shalaby; and IM 2014 in Orlando, where we held both a PA "town hall meeting," and our annual reception in conjunction with the DE chapter. The educational sessions were outstanding and well received by nearly 300 PA members in attendance. Next year IM 2015 will be held in Boston, MA where the college will celebrate its 100th anniversary. The meeting will run from 30 April to 2 May. Why not put that on your calendar now for next year. The PA chapter will be represented in Washington DC on 21 and 22 May with one of ACP's largest state delegation at the annual Leadership Day on Capitol Hill, addressing issues like the SGR fix, Medicaid expansion and student debt. Thank you for all you do, individually and collectively to provide healthcare and support to your patients and families, and to provide education for the next generation of physicians who are pursuing a career in Internal Medicine. Please remember that you can connect with us by reaching out to our Executive Director and me as well as through our Facebook and www.linkedin.com sites. The Pennsylvania Chapter is now on Facebook. You will learn more about Chapter activities, as well as the accomplishments of friends and colleagues. Most important: Please remember to "like" our page! You can now connect by region on LinkedIn. The Chapter has created a LinkedIn page for each of the three regions. These are private groups that are only open to ACP members of each specific region. This will allow members to more fully engage in a variety of discussions. When on www.linkedin.com, search for your region - PA ACP East, West or Southeast - and submit a request to join. If you do not know your region, click here to review regional assignments by zip code. The Eastern Region will hold its 2014 Poster Competition on October 25 at Pinnacle Health in Harrisburg. All residents and medical students who have provided the ACP with an email address will receive information regarding the submission of abstracts and details regarding the Poster and Medical Jeopardy competitions. The ACP unveiled a High Value Care Coordination Toolkit designed to enable more effective and patient-centered communication between primary care and subspecialist doctors. Follow this link to obtain the toolkit. On May 14 the ACP, CECity, and Pfizer Inc. announced a new public health initiative designed to increase unacceptably low adult vaccination rates by assisting physicians and other health care providers in strongly recommending appropriate vaccination and tracking adult immunization rates for quality measurement and improvement. Click here to learn more. Drs. Daniel B. and C. Eve J. Kimball of Wyomissing were honored with the 2014 Health Care Champion Award at the seventh annual awards breakfast of the Berks Visiting Nurse Association. As you know, Dan Kimball is also our PA-ACP Eastern Region Governor. Congratulations to the Eastern Region Governor-Elect, David L. George, MD, FACP! He will do a year of training as Governor-elect and then will start his four-year term as Governor in the spring of 2015. Dr. George is currently Vice President and Chief Academic Officer, Reading Hospital, Reading Health System. To learn more about Dr. George, read his vision statement. ACP unveiled our new logo and tagline - 'Leading Internal Medicine, Improving Lives' with an inspirational video at Internal Medicine 2014. ACP's new logo presents us in a contemporary, vibrant style, while maintaining a link to our rich history by incorporating the traditional element of the lamp of knowledge. Our new tagline speaks to the accomplishments of our members as well as to ACP's role in the field of internal medicine. With the spring primary in the rearview mirror, we now know that the gubernatorial election will see Governor Tom Corbett and Lt. Governor Jim Cawley facing Tom Wolf, a York County businessman who was Secretary of Revenue under former Governor Ed Rendell, and his running mate State Sen. Mike Stack of Philadelphia, who is Democratic Chairman of the Senate Banking and Insurance Committee. Early polling shows Wolf with a double digit lead over Governor Corbett, but it is very early and a long way until November with tens of millions of dollars yet to be spent in convincing voters. With all 253 House seats and half of the State Senate seats up for election this fall, we anticipate much of the legislative scene the rest of the year will focus on two things: passing a state budget; and positioning policies with one eye on the elections. The Commonwealth's Medicaid waiver request is still under consideration by HHS, and the Corbett Administration is hoping for an early June decision that will allow any savings to be reflected in the budget. PA-ACP continues to work for the expansion of Medicaid to cover more than 500,000 new beneficiaries, for primary care loan forgiveness and residency slot expansions, and improved funding for Graduate Medical Education, part of the state's Healthy PA program. Payments for primary care services were increased this spring. The state budget is a major hurdle for the General Assembly, with projections of as much as a $1.4 billion shortfall. Legislative leaders do not want to increase taxes in an election year. We anticipate a combination of cuts in programs, transfers of funding from other dedicated sources, and perhaps some moderate fee increases. An agreement on pension or liquor system reform could improve the budget picture, but denial of the Medicaid waiver could immediately increase that deficit. Pennsylvania has advanced practice nurses are pushing for practice independent of collaborative physician agreements. In addition, pharmacists are seeking to provide injections, immunizations and biologicals to children. PA-ACP is working to ensure responsible care for all patients in the Commonwealth. The legislature is also looking at creation of a statewide prescription drug database and a renewal of the PA Health Care Cost Containment Council for another three years, both with PA-ACP's support. Multiple bills have been introduced to regulate integrated health care delivery systems, and in response to the UPMC/Highmark contract battle. PA-ACP is monitoring these bills as they are introduced. At times, efforts on non-healthcare bills are also important to internists. For example, one property tax reform bill would shift school funding from property taxes to professional services. PA-ACP is working to protect your interests in discussions about this bill. This spring, Pennsylvania passed the Indoor Tanning Registration and Regulation Act, which requires registration and health warnings for tanning facilities, and limits use of the salons by children under 18. After the budget is passed, the legislature will have a limited schedule for the rest of the year. Barring some major change, it is very unlikely that major legislative initiatives will be pressed. The 2014 Pennsylvania Leadership Day delegation. 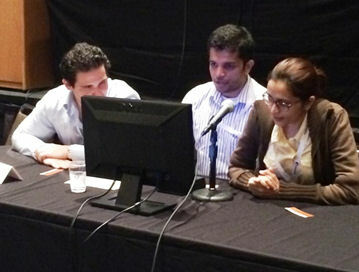 Front row (L to R) Christine Prifti, Katherine Greco, Sravanthi Koduri, Natalya Klebanov, MD, Jeffrey Jaeger, MD and Arpan Patel, MD. Rear L to R) Greg Kane, MD, Larry Jones, MD, Danielle Krol, MD, Darilyn Moyer, MD, Dan Kimball, MD, Jonathan Gotfried, MD, and John Derrickson, Executive Director, PA-ACP. There will be three categories for abstract submission: Research, Quality Improvement and Clinical Vignettes. We strongly encourage you to submit in the QI and Research category as these are typically under represented. All lead abstract authors and Medical Jeopardy participants must be members of the ACP. Your ACP membership number is required for electronic submission. Student membership is also required. Electronic abstract submissions will be accepted from July 1 to July 31. More details will be available on the Chapter website. The Convocation of the ACP is an annual ceremony whereby the College recognizes and applauds its new Fellows and the recipients of various honors. 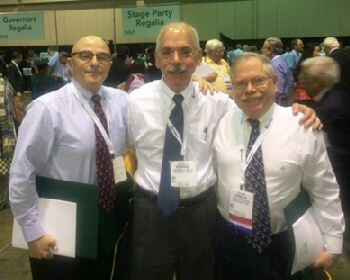 Congratulations to Charles Cutler, Arnold R. Eiser and Ezekiel J Emanuel who became Masters of the College during IM 2014. Candidates must make a notable contribution to medicine to be considered for Mastership. It was an honor for two of our members to be awarded national ACP awards during IM 2014. The William C. Menninger Memorial Award for Distinguished Contributions to the Science of Mental Health was presented to Charles P. O'Brien, MD, PhD and the Nicholas E. Davies Memorial Scholar Award for Outstanding Contribution to Humanism in Medicine was received by Steven J. Peitzman, MD, FACP. Einstein's unbeatable team, national champions for the sixth time, accepted the Osler during a ceremony in Orlando. Team members from (L to R) are Drs. Perelas, Punjabi, Wykretowicz, Garrido, Ramakrishnan and Garcia. A segment from the Osler Cup ceremony ran on Channel 6 ABC Philadelphia. Click on view to watch the segment. This is not available for viewing on mobile devices. According to Channel 6 Action News, "If you think the questions on Jeopardy are tough, imagine if all the categories were about medicine. 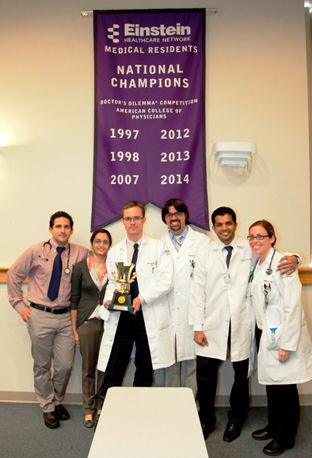 There is a national competition hosted by the ACP called Doctor's Dilemma, or Medical Jeopardy, and once again the champs are from Philadelphia. This was the sixth win for the Einstein team. In true Philadelphia style, they did it with a come back in the final game. Pretty exciting!" 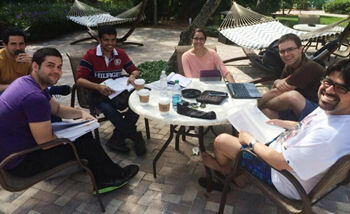 Also, check out this You Tube video featuring Einstein team member Praveen Ramakrishnan celebrating Einstein's success during the national Doctor's Dilemma competition in Orlando. 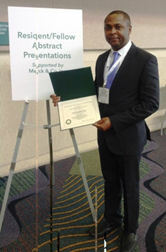 Dr. Obiora Maludum, research podium presenter/winner at ACP's recent national meeting in Orlando. He is a PGY2 at the Einstein Medical Center in Philadelphia. 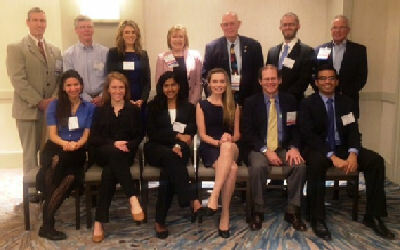 We were honored to have so many chapter members represent our chapter for the Associate and Medical Students Abstract Competition held during Internal Medicine 2014. The following were Podium Presenters or Poster Winners. 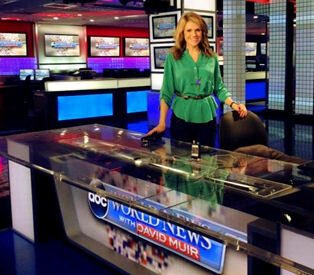 Danielle Krol, MD, a member of the Southeast Region, PA-ACP, recently incorporated medical journalism into her career in medicine by working on the Medical Unit at ABC News headquarters in New York City. During this experience, Danielle has worked closely with ABC's chief medical corespondent Dr. Richard Besser, the former Director of the CDC. At ABC, she learned the key components of how new scientific research makes the news. She was a key component of the medical team - researching and writing medical news for World News with Diane Sawyer, Good Morning America and Health. Her future plans include Oncology Fellowship and medical media correspondence. Einstein Team enjoying their Medical Jeopardy prep. 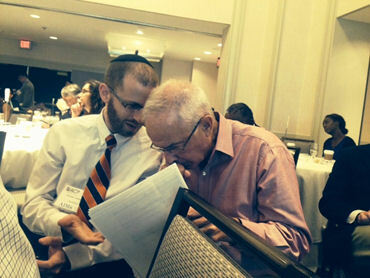 Jonathan Gotfried, MD (L) and John Derrickson, Executive Director, PA-ACP (R) preparing for their visits to Capitol Hill. Danielle Krol, MD with her mentor Dr. Richard Besser, MD, ABC News' Chief Health and Medical Editor. The Eastern Region welcomes our new Members! We look forward to meeting you and invite you to join us at our various activities planned for the year.